Won “PartinG” Lee Sak is the winner of the 2012 Global StarCraft 2 Finals after a six game Protoss v Protoss series against Jang “Creator” Hyun Woo. PartinG not only holds the first world title, but he has also just won the largest grand-prize in StarCraft 2’s history: $100,000. It was a thrilling conclusion to the occasionally troubled Shanghai tournament, where so far players and casters have battled a mass food-poisoning, poor stream quality, technical difficulties, and, in one case, even some gangsters. But for a few minutes, at least, all that could be forgotten as two evenly-matched Protoss players competed for the greatest prize the sport has seen to date. While Creator took a lead with a Game 1 victory following a slugging match between Colossi, PartinG answered back immediately with a swift Game 2 victory after he spotted Creator’s early Pheonix. That was his cue for an all-in Stalker attack on Creator’s main. He got one Stalker up the ramp, blinked the rest in, and forced a GG from Creator as his Stalkers ripped through Creator’s Zealot defenders. 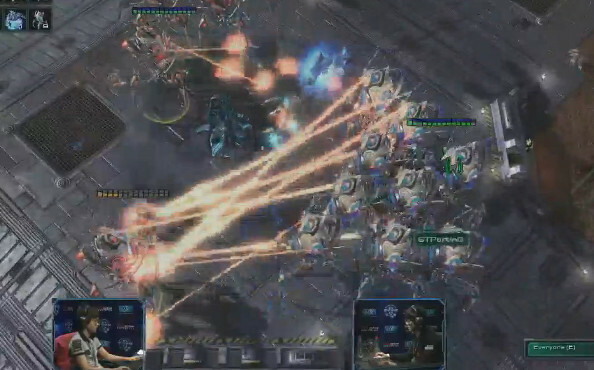 Creator went on to lose the third game on Antiga Shipyard due to a fumbled Colossus push that gave PartinG’s outnumbered and outgunned force a favorable engagement. He rallied in the next game, however, when PartinG got too aggressive and went all-in with a Stalker rush that Creator neatly picked apart with few losses. Creator lost the next game on Cloud Kingdom, however, when his Colossus-Immortal-Zealot attack foundered against PartinG’s perfect defense. 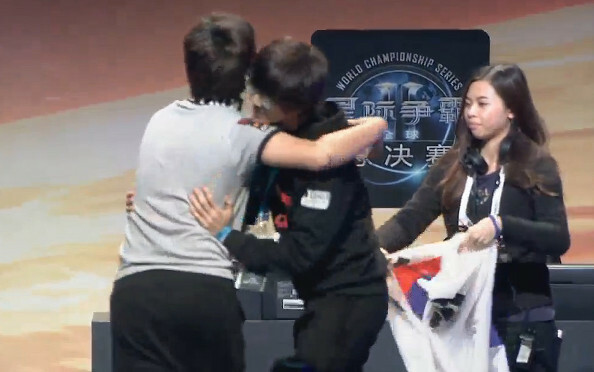 With PartinG just one game from the world title, Game 6 on Tal’Darim altar was one of the day’s most intense. PartinG trapped Creator in his base for several minutes with a Stalker force, but Creator turned the tables and nearly cut those Stalkers off from home as Creator began his own push toward PartinG. He had only one chance to break PartinG’s advantage, since he could never make up for the time he’d lost, and so he staked everything on a Stalker all-in. The two were evenly matched and traded hammer blows, but PartinG’s micro and numbers were too strong and Creator had to concede. Touchingly, both players dashed out of their booths and embraced at center stage, Creator’s hug almost knocking PartinG from his feet. There were no hard feelings here at the end their hard-fought series, a series that added enormously to both players’ reputations and status. 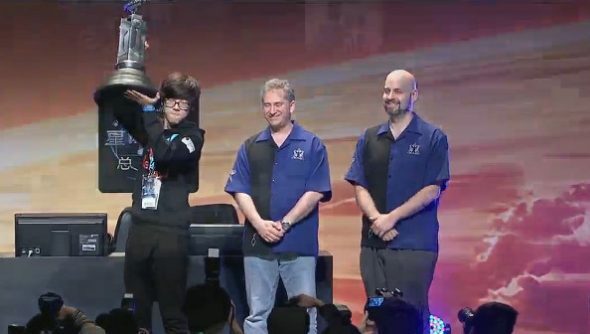 PartinG then accepted his congratulations from Blizzard’s Mike Morhaime before picking up the terrifyingly-huge trophy and giving it the customary kiss. The weekend wasn’t just about the grand prize, however. A lot of minor dramas played out on this biggest of stages. One big winner was like Evil Geniuses’ Greg “IdrA” Fields, whose play went a long way to quieting doubts about his fitness. While he went out with a 3-1 loss against SK Telecom’s Rain, this weekend saw his strongest tournament performance of the year, and he showed a mental toughness and decisiveness that have, at other times in his career, been lacking. His Game 3 victory on Ohana, when he was facing elimination, was one of the best games of the tournament as Idra came back from a devastating early attack by Rain with a daring counterattack of his own. It gave IdrA a small lead that he was able to build despite coming under fierce pressure from Rain, and eventually he pulled out a victory. While he lost the next game, IdrA had lost to one of the sport’s best and the third-place finisher at the World Championship, and demonstrated some marked improvement in his own play. Nobody showed off improvements like Evil Geniuses’ Conan “Suppy” Liu, who came to the tournament thanks to another player’s decision to decline his invitation. Suppy is new to Evil Geniuses and has assembled a good record at minor tournaments, but nobody expected him to step up and compete at an elite level the way he did this weekend. He won his group, then made it through to the round of eight where he came within a whisker of beating PartinG before losing 3-2. Since PartinG went on to play in the final, it’s not a defeat that should cost Suppy any sleep. Meanwhile, the Spanish duo of brothers Juan “VortiX” and Pedro “LucifroN” Moreno Duran further cemented their reputations as two of Europe’s best, facing each other in the round of 16. In keeping with that theme, their five game series was cast by the Plott brothers, Tasteless and Day. It was likely the sweetest moment of the tournament. The saddest was probably HerO’s defeat at the hands of Taiwanese Zerg Sen. HerO has had a bruising couple months in competition, and he was one game away from the semifinals when he bungled an engagement against Taiwan’s “Sen” and gave up a nearly certain victory. He lost their deciding Game 5, and was so crushed that he could not even acknowledge Sen’s postgame congratulations. Nobody else at this tournament looked so defeated, but nobody else had so much to regret.